CES in Vegas is where the globe’s technology brands for the past 51 years have converged to brag, showcasing what they are doing in advancing technology. This year, an estimated 3,900 exhibitors from 150 nations will have done so to over 180,000 forecast visitors and a global media audience. An impromptu power cut only added to its media appeal, gaining it more mainstream coverage than ever before. No surprise was that the smart home dominated, with Google announcing that its Assistant had sold more than six million units – that’s one every second – and also now runs on 400m devices globally. Unfortunately, there are no statistics from Amazon, but with more than 1,500 smart-home devices from more than 225 brands, all supporting Google Assistant, the winner may have been identified. A lot of third-party brands are choosing to support multiple AI platforms, not wanting to gamble on a specific one. As a result, there are many now supporting multiple AI platforms in particular Alexa and Google Assistant integration, which dominated CES. Not Samsung, though, whose Bixby assistant was integrated into a smart fridge with AKG speakers, making it a multimedia centre for your kitchen. Its only real game-changing feature is the ability to create smart notes sent remotely by users via text message to inform those in the home of messages like ‘buy more toilet rolls’. What these innovations offer brands and retailers are alternative methods to engage passively with users, introducing new, intuitive technology into the home. Ordering shampoo or switching to another ‘recommended’ brand, while in the shower, further enables new advertising opportunities and gives retailers different purchasing channels perhaps never before considered. Despite changing viewing habits influenced by ‘streaming’, TV remained a headline-grabber at CES. In particular for LG, whose dominance in the category is propelling the brand into pole position. Firstly, it introduced us to the rather neat 65in LG roll-up TV – a 4K panel that curls up like a blind and unfolds into a 65in panel. Quite how the OLED screen is able to completely roll away, while still remaining rigid, is a secret that LG isn’t willing to share. The display doesn’t have to be completely retracted. You can lower it only part-way, allowing you to change its aspect ratio from 16:9 to the cinematic 21:9, meaning you can enjoy your ultra-wide movies without those black bars. With another press of the remote, the panel retracts to a wide strip at the top that can be used to show smart-home information, music controls, or whatever other updates you want to see. As it’s still a prototype, don’t expect availability or pricing any time soon. OLED, launched at CES 10 years ago, is now the lead form factor in TV, and with an estimated 2.35m units predicted in 2018, up 1.4m on 2017. It’s now 25 per cent of the premium [over £1,000] TV market. 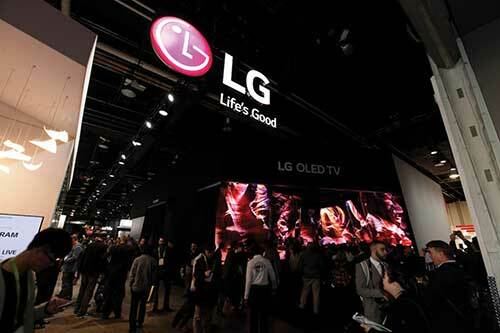 Other notable brands launching new OLED ranges were Sony and Panasonic. LG, not content with one a show-stopper, also launched its 88in 8K OLED screen, offering 33m pixels and it may be here sooner than you think. While the feature film Marvel’s Guardians of the Galaxy Vol 2 was shot in 8K, there is virtually no 8K content available. There are plans to roll out full 8K services by 2018, with Japan once again leading the way. The plan is to air the Tokyo 2020 Olympics in 8K through broadcaster NHK, so TVs may well begin to go on sale in time for the 2020 summer Olympics. Among all the connected home fever at CES were two of my favourite innovations. The first was the ForwardX CX-1 smart suitcase, which knows its owner using face-recognition to follow you through the airport concourse. It also comes with a smart wristband, just in case it loses you. The second was the L’Oréal UV Sense. I think it’s perhaps the biggest game-changer and possibly the one that will become mainstream sooner. It’s a battery-free adhesive disc that measures UV exposure for the wearer. It’s relatively unobtrusive and uses NFC to let you retrieve your data with your mobile device. Its applications are infinite. L’Oreal’s presence at CES demonstrates how technology can become mainstream through the most passive of devices and categories, creating a challenge for all marketers and retailers.